Description: Inspired by ancient European tilework- this fun variation of the traditional Nine Patch is full of movement. Two versions of instructions are included in the pattern for this quilt. Version 2 is for those who wish to use fat quarters and larger pieces of fabric for the 9 patch squares. 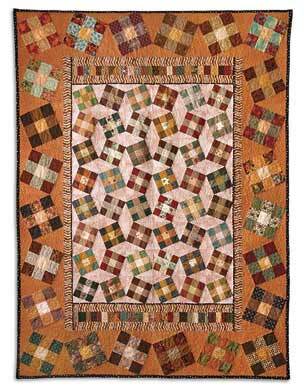 This option allows some strip speed piecing methods to be used and gives a more uniform look to the quilt. Complete supply list is for both versions is included.